Need a full time nanny for my youngest child. Older son is is preschool full time. There may be some occasional weeks where he is off from school or feeling sick where the nanny will need to watch both kids. We like for our daughter to spend time outside and going to the library for story time. Sticking to her schedule is really important to us. I am looking for nanny share family for my little one starting Jan. I do have an amazing nanny, fully background checked/ cleared and my LO is 11 MO! I live in San Bruno and will be hosting. We our from India and We speak English and Hindi at home. We require many a few hours per week. 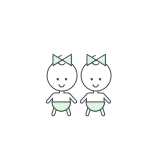 We're looking for the right nanny to take care of two 15 month old girls in a nanny share. Our families are good friends, we have similar parenting styles, and the girls have been together in a nanny share for the past 11 months, so we have a good set up in place! We just need an excellent nanny to help our girls continue to grow and develop in this next phase!